In the travel section of our newspaper this week, Wiltshire, England was a recommended destination to see Stonehendge and crop circles ........... crop circles? 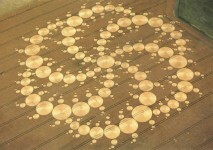 Many of the crop circles in England appear mysteriously overnight. They are often huge but appear quite suddenly. Theories of their makers range from aliens to extreme weather. The spookiness of this activity will engage students as they find the potential of compass and ruler.